Mourners heard from friends and colleagues of Sen. John McCain, including Vice President Joe Biden and NFL star Larry Fitzgerald, at a memorial service in Phoenix Thursday that commemorated the life of the maverick politician, former prisoner of war and two-time presidential candidate. They spoke to the force of McCain's will and the depth of his beliefs, especially in the country and the people he served before dying last Saturday of brain cancer at 81. 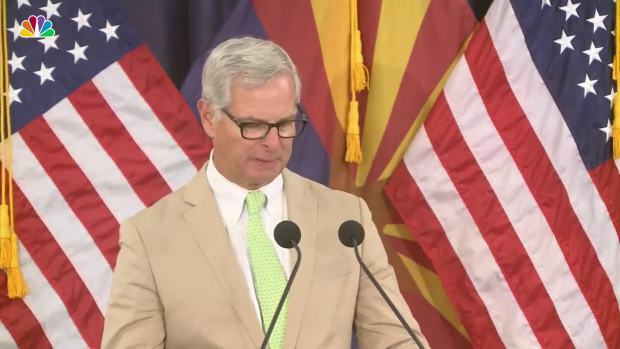 The service for the statesman unfolded at Phoenix's North Baptist Church after a motorcade bearing McCain's body made its way from the state Capitol past crowds of people waving American flags and campaign-style McCain signs. 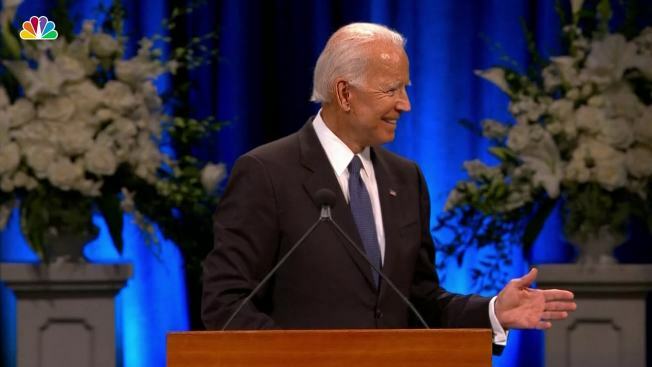 Addressing an estimated 3,500 mourners inside the church, Biden said of his longtime confidant in the Senate, "John's code was ageless, is ageless." Biden recalled their travels around the world as senators, where they formed a bond as close as brothers despite their opposing party affiliations. The former vice president remembered the day in 1996 when their party leaders went up to both Biden and McCain separately and told them it looked bad that they were so close. Biden identified that as the day "things began to change for the worse in America," when political opponents began to question each others' motives instead of the substance of their arguments. McCain's last act in the Senate, scuttling a fast-track bill that would have repealed and replaced the Affordable Care Act, was an effort to bring back "regular order" in the Senate, Biden said, referring both to the process where senators debate a bill for weeks and to a greater sense of bipartisan cooperation among Americans. "It was underlying values that animated everything that John did, everything he was. You could come to a different conclusion but where he would part company with you is if you lacked the basic values of decency, respect, knowing that this project is bigger than yourself," Biden said. Biden lost his son to the same form of brain cancer that killed McCain, and which killed Sen. Ted Kennedy about a decade ago. Often deeply emotional as he referred to his own pain, Biden sometimes directly addressed McCain's family: "I pray you take some comfort knowing that, because you shared John with all of us your whole life, the world now shares with you the ache of John's death." 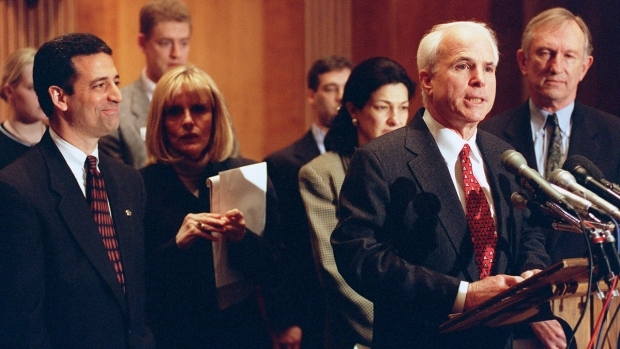 McCain's longtime chief of staff and former Arizona Attorney General Grant Woods recalled McCain's humor in Congress. Arizona Cardinals wide receiver Larry Fitzgerald discusses his unlikely friendship with Sen. John McCain. Woods drew laughs with a eulogy in which he talked about McCain's "terribly bad driving" and his sense of humor, which included calling the Leisure World retirement community "Seizure World." "Through it all, he was resolute, he was courageous every step of the way. And in Arizona, he was our hero," Woods said. 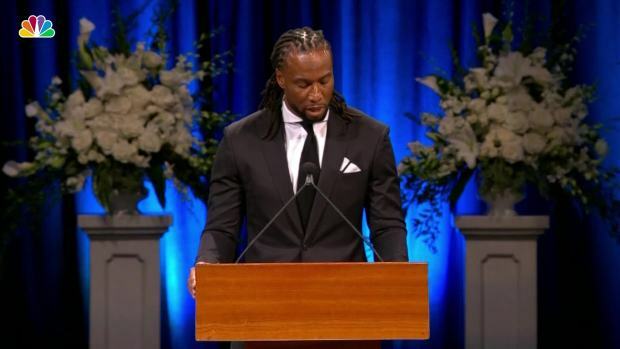 McCain's friend Larry Fitzgerald, who plays for the Arizona Cardinals in the NFL, reflected on their unlikely friendship, which led Fitzgerald to the Vietnamese prison camp where McCain was held captive and leadership forums in Sedona, Arizona. "What made Sen. McCain so special was that he cared about the substance of my heart, more so than where I came from," he said. A choir from the Jesuit-run Brophy College Preparatory school that two of McCain's sons attended sang "Amazing Grace" and "Arizona" during the church service. Sen. John McCain will lie in state at the Arizona State Capitol Wednesday as part of a series of funeral events over the next four days. A memorial service will be held in Phoenix on Thursday and then McCain's body will be flown to Washington, D.C. for a procession past the Vietnam Veterans Memorial. A funeral service will follow at Washington National Cathedral. McCain will be buried at the U.S. Naval Academy in Annapolis on Sunday. The music chosen for the recessional was Frank Sinatra's signature song, "My Way," paying tribute to a man who became known for following his own path based on his personal principles. A motorcade then took McCain's body to the airport, where it was put aboard a military plane that took off for Washington for a lying-in-state at the U.S. Capitol on Friday, a service at the Washington National Cathedral on Saturday, and burial at the U.S. Naval Academy in Annapolis, Maryland, on Sunday. McCain sons Doug, Jack and Jimmy, daughter Sidney and daughter-in-law Renee shook hands with some of the estimated 15,000 people who filed past the senator's flag-draped casket to pay their final respects. Michael Fellars was among those awaiting the motorcade outside the church Thursday. The Marine veteran said he was also the fourth person in line Wednesday to attend the public viewing at the Capitol. Associated Press writers Anita Snow, Jacques Billeaud and Nicholas Riccardi contributed to this report.